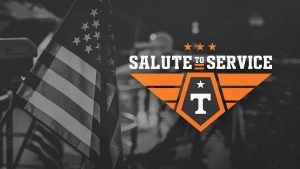 KNOXVILLE, Tenn. — Tennessee Athletics’ “Salute to Service” weekend begins this Friday as the Volunteers will recognize active members of the military and veterans through Sunday. The weekend kicks off with the National Gold Star Memorial. Titled, “Remembering Our Fallen,” the memorial features 31 towers with more than 5,000 photos and will be on display at the UT pedestrian walkway between Hodges Library and Clarence Brown Theater from Thursday evening until Sunday afternoon. The memorial honors our nation’s fallen since 9/11. There will be a wreath laying ceremony open to the public on Friday at 7:30 p.m. Parking will be available in the Staff-23 parking lot at the intersection of Melrose Place and Andy Holt Avenue behind the Clarence Brown Theater. Parking will also be available in the Volunteer Boulevard Garage (G-16) at levels G-2 at Volunteer Boulevard and Pat Summitt. The display will also be available to those attending the football game all day on Saturday and a public viewing is recommended on Sunday – Veteran’s Day – from 8 a.m. to 4 p.m. Parking will be available at Staff-23 as well as G-16. Gold Star families from Tennessee and Kentucky in attendance at the UT vs. UK football game who have lost loved ones will be recognized on the field prior to the kickoff. HonorAir Knoxville, Prestige Cleaners and Prestige Tuxedo in partnership with the University of Tennessee are sponsoring the National Gold Star Memorial, which is one of several “Salute to Service” initiatives on campus this weekend. When the defending SEC Champion Volunteers host the Ragin’ Cajuns on Friday, current military members and veterans may present a Military ID or DD 214 at Gate C, Gate E or the ticket tent located on Phillip Fulmer Way prior to entering Thompson-Boling Arena for complimentary admission for themselves and any immediate family members. Complimentary tickets purchased—along with those matched by Tennessee Athletics—through the Seats for Service Members initiative will be donated to East Tennessee military and veterans organizations to attend Tennessee’s football clash with Kentucky on Nov. 10. A flyover performed by the 134th Air Refueling Wing, a unit of the Tennessee Air National Guard stationed at McGhee Tyson, will take place at the end of the National Anthem depending on weather conditions. A new initiative announced earlier this fall, Tennessee Athletics is proud to recognize a pre-selected service member or veteran as the “Volunteer of the Game” at each football home game. The Volunteer of the Game honors the history of the Tennessee Volunteers nickname and the proud heritage of The Volunteer State. Jim Cundall, a veteran of the Vietnam War and Gulf War, is the Volunteer of the Game this Saturday. Installed in Neyland Stadium for the 2018 season and beyond, the POW/MIA Chair of Honor is a single black chair which will remain unoccupied in honor of service members declared as prisoners of war or those missing in action. The Chair of Honor symbolizes that there will be a place saved in Neyland Stadium awaiting their return. The POW/MIA Chair of Honor was unveiled earlier this season for the Florida game on the heels of National POW/MIA Recognition Day. The Chair of Honor is located in the north upper endzone, to provide an expansive view of the gameday and pageantry in Neyland Stadium. Tennessee has only eight retired numbers, and four of those belong to four former football players who died during World War II. No. 32 Bill Nowling, No. 49 Rudy Klarer, No. 61 Willis Tucker and No. 62 Clyde “Ig” Fuson are forever memorialized on the upper deck inside Neyland Stadium along with all-time great VFLs: Peyton Manning, Johnny Majors, Doug Atkins and Reggie White. The four numbers for Nowling, Klarer, Tucker and Fuson were retired on Sept. 9, 2006. 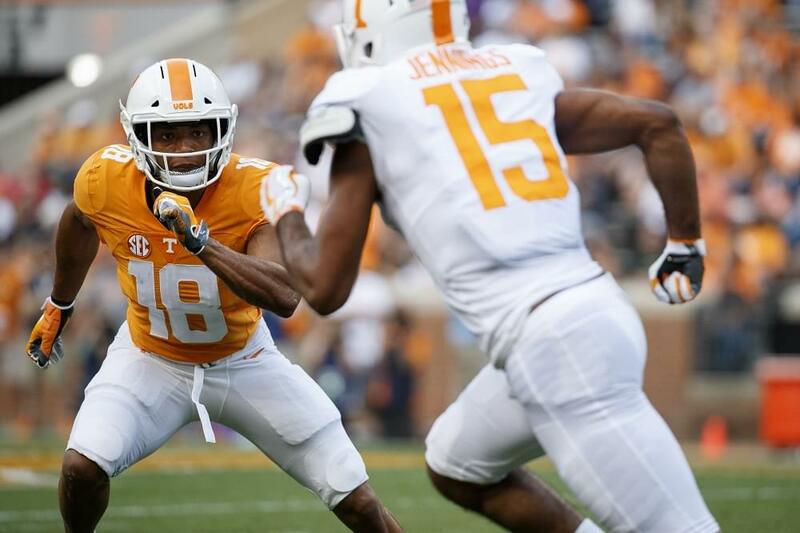 Fans now can team-up with Tennessee Athletics to help East Tennessee service members, veterans and their families enjoy a game in Neyland Stadium by contributing to the purchase of a ticket for a service member. Just $35 purchases a single ticket, and contributions of any amount will be combined to purchase seats. Tennessee Athletics will match every ticket purchased for the Kentucky game, up to 750 tickets. Tickets to the Tennessee-Kentucky football game on Nov. 10 will be donated directly to 10 local and state military and veterans’ organizations that Tennessee Athletics has identified as longstanding partners (the same was done for the UTEP game on Sept. 15). Fans interested in contributing to “Seats for a Service Members” are encouraged to call 1-800-332-VOLS. Tennessee Athletics does not facilitate individual requests for tickets. Rather, tickets are distributed directly to UTAD partner organizations. When the Lady Vols host Presbyterian on Sunday, Nov. 11, current military members and veterans may present a Military ID or DD 214 at Gate C, Gate E or the ticket tent located on Phillip Fulmer Way prior to entering Thompson-Boling Arena for complimentary admission for themselves and any immediate family members. Fans in attendance wishing to show their support for veterans may stop by the Kids’ Corner located on the arena concourse at Gate F / Section 116 during pregame to write or draw a card for a Tennessee veteran. Cards will be delivered to East Tennessee VA centers and clinics. During a scheduled timeout in the game, a deserving family from each branch of the military will be recognized on the court to honor and celebrate Military Family Appreciation Month. And in conjunction with the Office of UT Veterans Services, one “Lady Vet” will be selected to enjoy the game from premium seats with access to the Ray Mears Courtside Club. In addition to complimentary admission for active military and veterans, free parking and shuttle service is available from UT’s Ag Campus. Additional game promotions will be updated at UTSports.com/FanExperience.